All kinds of products aspire to be "for everyone" - all readers, all users, all children, all kiteboarders, all whatever. Rarely are these claims accurate, because most things are not really one-size-fits-all. However, when it comes to appealing to guitarists of varying skill levels, Dave Mustaine: Guitar Prodigy succeeds. Granted, this app is geared towards fans of the heavy metal band Megadeth, for which Mustaine is the lead singer and guitarist (others should check out the general version of Rock Prodigy). But if you're into Megadeth and want to learn how to play it, this iOS app will come through. Unlike many music apps, Dave Mustaine: Guitar Prodigy is not a toy. Guided by Mustaine's own voice, you can actually learn everything about playing these songs, even including how to hold your guitar. It works with acoustic guitars (using the mic on your iPhone, iPod Touch, or iPad - or a headset mic attached to one of these) or electric guitars (in which case you plug straight in to the iOS device). "Better than a private lesson, and more fun than any guitar game, my app, ‘Dave Mustaine: Guitar Prodigy‘ actually teaches you how to play guitar, and with the leader boards you shred while you kick your friends *sses," said Dave Mustaine in a statement provided to Evolver.fm (see our full interview with Rock Prodigy at the bottom of this review). The main interface is a bit like the Guitar Hero videogame, as one might expect - and this is a good idea, because for a generation, the two concepts are inextricably woven together. However, instead of tapping plastic buttons, you're playing a real guitar. The developers at Rock Prodigy (one of whom we met at SF Music Tech) appear to have thought of everything - how to let you pause lessons; rewind and fast forward by swiping the screen (crucial, because you're going to need to play some of these parts many times through in order to learn them); check note and chord names; tweak the mix between your guitar and Dave's; slow down the song; loop sections; flip the fretboard over to lefty mode; and even take a break to tune your axe with an in-app guitar tuner. Like we said, this isn't a toy - but it's also a damn sight more fun than we remember most music lessons being. You can learn at your own pace, and, it must be said, learning guitar this way does feel fun in the way that a videogame is fun. As if to prove that point, the app is compatible with Apple Gamecenter, which can track and share your progress. Want to raise the next guitar prodigy? Lock your kid in a room with a guitar, an iPad, and this app, and wait a few months. Or, if you want to brush up on your own skills, and love Megadeth, it's certainly worth the $10 asking price. Eliot Van Buskirk, Evolver.fm: What were the challenges of doing this with Megadeth specifically? I can imagine it was more complex given all the shredding. Harold Lee, CEO of Rock Prodigy: Megadeth and Dave Mustaine's style is very complex. Even when we thought we knew how something was played, when we actually sat down with Dave, we found it was played differently. For example, in the Dave's first lead of "Public Enemy No. 1," we had transcribed one lick at the 12th fret using the 1st and 2nd strings. Then we showed him. He said, "Huh? Nope." He showed us how he did it on the 17th fret using the 2nd and 3rd strings. Pow! Synapses fired in our brains and our hearts raced faster! It all made sense, and it just felt right. Those unique insights made the Megadeth extremely challenging for us to develop - and that much more rewarding for us to complete. A long way of saying: Yes. Megadeth is the complex of the complex. There are more notes per minute than say 99 percent of the music out there. And there are unusual Phrygian-tinged, Dorian-blues-pentatonic, symmetrical five-notes per beat patterns - not stuff you learn in your first-year classical counterpoint courses in college. But don't be intimidated; learning it from Dave, even if at slow tempo, will make you a better player. Dave cares 100 percent that we get the music right. He demands that. Working with him on this project made the product better than we ever imagined. 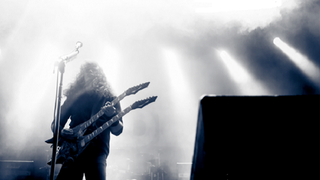 Evolver.fm: Do Megadeth fans have iOS devices, or are you worried about that at all? Do you have any evidence that they do? I'm just trying to figure out if the audiences intersect, and figure you might have looked into that. Lee: We did some research and testing via Megadeth's Facebook and fan club and there was a solid response for fans with iOS devices. While iOS is definitely not 100 percent universal, the platform is still growing so more and more people will have an iOS device. Evolver.fm: I was skeptical that this would really work with any guitar (like, even an acoustic). Do you have any tips on how far away to place the iOS device, etc.? Lee: We do a lot of testing using acoustic guitars. I personally use a 1986 Celebrity Ovation (The first year they made them - $169), unplugged, with the standard Apple headset that comes with iPhone. With the headset, the mic will be somewhere above and in front of the acoustic body. As a rule of thumb, when using an acoustic with the headset or the built-in mic and headphones, if you can hear your own guitar as much as you can hear the recorded music in the app, you'll be good. For fine tuning, there's a Settings button in the app that lets you adjust the mix. You can check the gray input meter along the left edge of the app that bounces up and down to your level of your signal. Evolver.fm: Does Rock Prodigy plan to do more individual artist apps like this? Do more people want to learn songs by specific people than just guitar in general? Lee: Yes, more individual apps are on the way. We've been super lucky to meet with managers and artists themselves because of our investors and Advisory Board. We find that once managers and artists see the app, they say, "Hey, how about making one for me or my band?" And then we're off programming and coding. We want you to play what inspired you: You heard something on Spotify, saw it on So You Think You Can Dance, rocked out to it at the club, or whatever… That's the spark: you want to play and sound like that artist/song/recording/performance. So Rock Prodigy is all about getting you to quickly start playing the right notes at the right times along to the songs themselves. So while people do want to learn to play guitar in general, we think you should learn by playing the music that you love first. Once you have basic proficiency, it's 10x easier to get theory and technique.